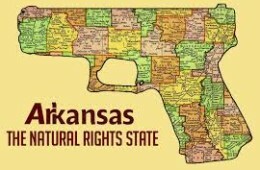 Next month the free citizens of the state of Arkansas join with those of Vermont, Alaska, Arizona and Wyoming in exercising their constitutional rights without having to beg for the governments blessing. Act 746 of the 2013 General Assembly was signed into law by Governor Mike Beebe on April 4th, 2013 establishing that the 2nd Amendment is a right that cannot and should not be administered or limited to free law abiding people by a bureaucracy or political whimsy. The naysayers may initially have a conniption fit and rail about blood in the streets and so on, but as any reasonable person can understand, Act 746 shifts the guilt to actually criminals while allowing the law abiding to exercise their right without interference. To wit: A person commits the offense of carrying a weapon if he or she possesses a handgun, knife, or club on or about his or her person, in a vehicle occupied by him or her, or otherwise readily available for use with a purpose to attempt to unlawfully employ the handgun, knife, or club as a weapon against a person. So, if you are a criminal executing an action with malicious intent, you are still going to be charged with a crime, but for law abiding John and Jane Q Citizen? They are not going to be punished and have their rights curtailed due to the actions of others. After the near miss in Maine, it is good to see that the momentum is still carrying forward and having 10% of the states with Constitutional Carry is something unheard of 20 years ago. I just hope that there are more principled members of state house legislatures around the country who are willing to forgo the money generated in the firearms permit scam and will fight for the rights of their constituents.